This image of Jewett Williams of Hodgdon, who served with the 20th Maine Volunteer Infantry Regiment during the Civil War, was taken circa April 1922 when he was admitted because of senility to the Oregon State Hospital in Salem, Oregon, where he died later that year at the age of 78. 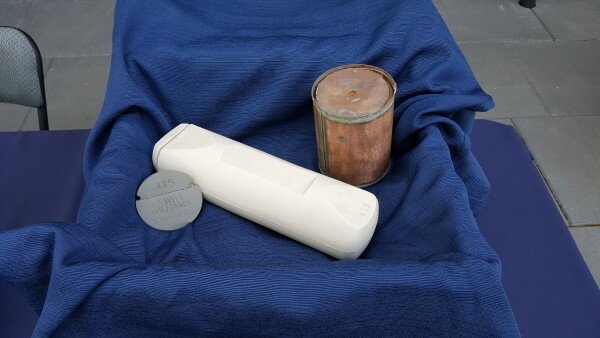 The cremated remains of Civil War veteran Jewett Williams of Hodgdon, Maine, were among the ashes of more than 3,600 people discovered in 2004 in the basement of Oregon State Hospital in Salem, Oregon. 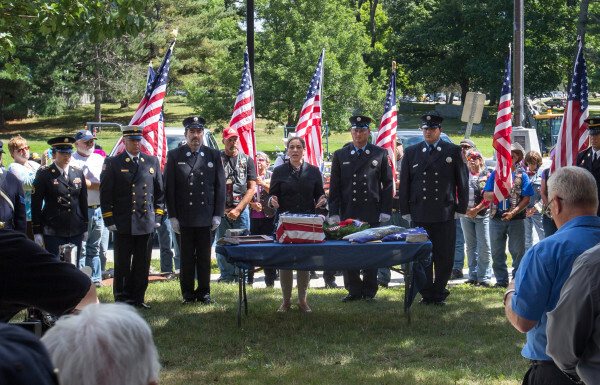 His remains were on display during a ceremony on Aug. 1 on the grounds of the hospital before they headed for Maine. 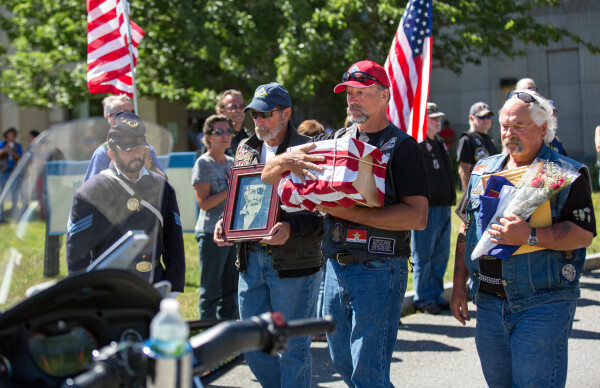 Patriot Guard Riders bring the remains of Army Pvt. Jewett Williams of Hodgdon, who fought for the Union Army in the famed 20th Maine, back to his transport vehicle after a ceremony on Aug. 22 outside the Togus VA Medical Center in Augusta. Adria Horn (center), director of the Maine Bureau of Veterans Services, speaks during a ceremony for Army Pvt. Jewett Williams of Hodgdon, who fought for the Union Army in the famed 20th Maine, on Aug. 22 outside the Togus VA Medical Center in Augusta. It’s been more than 150 years since members of the 20th Maine Volunteer Infantry Regiment fired their last shots in the Civil War, but a dispute over the ultimate resting place of a Mainer who fought in the war has sparked a new battle. This fight is over the fate of Army Pvt. Jewett Williams, a soldier from Hodgdon whose cremated remains were stored haphazardly at the Oregon State Hospital after his death in 1922 and finally brought home to Maine this summer. Williams’ long and epic journey east, made with the help of a battalion of Patriot Guard Riders who handed him over from one group of motorcyclists to the next like a modern-day Pony Express, warmed hearts and attracted media attention across the country. It also led to the discovery of two distant cousins in Aroostook County who decided they wanted Williams back so he could be buried next to his mother and father in the family plot of the Hodgdon Cemetery. Maine veteran officials enthusiastically agreed to this plan, but the decision has generated the ire of a small but vocal group of Mainers who want the soldier to be buried in Togus National Cemetery in Chelsea, or any other national cemetery where he will be in the company of military brothers in arms rather than his blood relatives. Her office has received several Freedom of Access Act requests for the documents that prove the family relationship between Jewett and the Hodgdon cousins. Additionally, the Hodgdon town manager has received an apparently threatening message about the burial happening there, Horn said, and Oregon state officials have heard from a Mainer who would like that state to take Jewett’s cremains back. But there is a reason, according to Christabell Rose, a member of the Falmouth-based Maine Living History Association. She traveled with Williams’ cremains all the way from Appomattox, Virginia, organizing ceremonies at state line crossings and is one of the people who feels strongly that Williams ought to be buried in a national cemetery. No one is disputing that Williams’ life after the Civil War was difficult. The soldier served toward the end of the war, when the 20th Maine helped chase Gen. Robert E. Lee west, according to Tom Desjardin, a historian who is researching what happened to each soldier who fought in the regiment. After the end of the war, Williams came back to Maine, married and then divorced his first wife about five years later. He remarried and left the state, according to the historian, moving with his wife to Michigan, Minnesota, Colorado, Washington state and finally Oregon. They had six children, none of whom apparently had their own children, Desjardin said, and the couple divorced in 1899 at her insistence. Williams was listed on census records from 1920 as still working as a laborer, even at age 75. He was sick and suffering from dementia when he was admitted to the Oregon State Hospital in 1922 and died three months later at age 78. His cremains and those of about 3,600 other mental health patients were buried at the hospital, then exhumed and discovered in 2004 in what has become known as the “Room of Forgotten Souls” in the hospital’s basement. The discovery prompted a renaissance in mental health care in Oregon, including the construction of a new state hospital. Still, the discovery of Jewett’s cremains remained unknown to his closest known relatives — two first cousins three times removed — until after Desjardin found him in Oregon and set the pieces in motion for the cross-country journey. Tanya Pasquarelli, a Hodgdon woman who is acting as a representative of the Williams family, said neither she nor the cousins had heard about the saga until late July, after plans had already been set in motion to have the soldier buried with fanfare during the Togus 150th anniversary on Sept. 17. The cousins decided that Williams should come home. Jewett’s funeral ceremony, scheduled for 2 p.m. Saturday, Sept. 24, at the Hodgdon Cemetery, is open to the public. Speakers will include Adjutant Gen. Douglas Farnham of the Maine National Guard, a local Baptist pastor and Mike Edgecomb, state captain of the Maine Patriot Guard. There will be two Civil War re-enactment groups dressed in uniform, any Patriot Guard Rider who wishes to accompany the cremains from Augusta to Hodgdon, members of American Legion Post 47, musicians and others, Pasquarelli said. Next weekend, the town is coming together to spruce up the cemetery. The plans for the funeral ceremony don’t dispel Rose’s concerns that Maine officials are not doing the right thing for the state’s native son. She and others have made it clear they prefer he be buried at Togus during the 150th anniversary celebration of the veterans’ hospital, the way it once had been planned. She also believes that when Williams’ journey home from Oregon began on Aug. 1, Maine officials knew — but did not share with the Patriot Guard Riders or the public — that the family would take possession of his cremains and bury him in Hodgdon, not at Togus. Horn disputes that, saying that while the state had learned at the end of July that there might be distant relatives, there wasn’t enough information available for anyone to “deviate from the original plan of holding a funeral at Togus on Sept. 17.” That changed when she got a letter on Aug. 9 from an 81-year-old distant cousin who lives in Houlton, who said he wanted people to know that Williams had a family, and then later in August when Horn heard from Pasquarelli on behalf of the other cousins. Still, that’s not enough to satisfy Rose. But that viewpoint doesn’t make sense to Horn and others who believe that the family has the best and highest priority to decide Williams’ resting place. Because of the dispute, she said, Togus officials decided on Friday that they will not mention Williams during next weekend’s 150th anniversary celebration for fear that the controversy would usurp that event. Instead, the cremains will stay at the Maine Veterans Memorial Cemetery in Augusta until a motorcade takes them on Saturday, Sept. 24, to Aroostook County. The procession will come into Houlton at 1 p.m. and travel down North Street and up into the center of town before turning toward Hodgdon and the cemetery there.